Whether you’re looking for beautiful countryside or rolling moors, tranquil coves or open beaches with water sports, picturesque villages or bustling towns, all packed full of great attractions and places to visit, and not to mention amazing food, South Devon has it all. Spend the day at a local attraction where all the fun and entertainment is taken care of. A day out at one of South Devon’s top attractions is exciting, thrilling and the perfect way to make memories that will last a life-time. We have great family attractions that will keep mums, dads, grandparents and of course the kids happy. Historical attractions which are certain to impress and ensure you walk away having learnt something new and arts and craft attractions which are sure to get you inspired to get creative in our wonderful landscape. Visiting South Devon doesn’t need to be costly. There are an abundance of activities and things to do that won’t cost you a penny! To help you start planning we have put together a list of 50 fun free things to do in South Devon. You can also pack up a picnic and a beach bag and spend the day on one of our stunning beaches or strolling through the magnificent countryside. Of course, you may want to bring a few pennies to stop for a delicious Cream Tea or hot chocolate. While we can’t guarantee the weather, we can guarantee that come rain or shine there’s plenty to keep everyone entertained. As well as the many great indoor family activities which can be found across the region, there are a wide range of historical buildings or gallerys waiting to be explored. Many offer guides and tours which allow you to really get to grips with the history, stories and facts of South Devon. The best way to really experience South Devon is outdoors! In order to make the most of our stunning coastline and countryside you’ll need to get out and explore it, and there’s no better way to see what the locals see everyday than cycling or walking across Dartmoor or along the South West Coast Path. Stop off at a quiet spot on an estuary and try your hand at fishing. Or for the more adventurous types get out on the water and spend an afternoon sailing. Hot Air Balloon rides glide over the beautiful countryside of South Devon, launching from Lee Mill near Ivybridge providing a convenient meeting place for residents and visitors coming from, Plymouth, Saltash, Ivybridge , Totnes, Kingsbridge, Brixham and Salcombe areas. . The flight path is generally within the Tavistock / South Dartmoor / Torbay / Kingsbridge area. 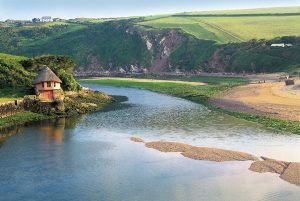 South Devon & the South Hams is an area of exceptional beauty, with river estuaries, rolling hills and 60 miles of spectacular coastline. The South Hams has a national status as an area of outstanding natural beauty, and it’s no wonder with a landscape, which has hardly changed in centuries. During a balloon flight in this area you could see the granite slopes of Dartmoor, ancient woodlands, mystical stone circles, famous tors and castles along with far reaching views across Lyme and Tor bays, Plymouth Sound and down into Cornwall.